Tel: 0870 7550 062 OR to listen to what films are playing 0207 733 2229. You can meet friends, eat great food and watch the latest films. The staff can show you where your film is playing. You can also see local artwork, join a workshop, meet friends or listen to live music at the Ritzy. Follow this link to find out what's on at the Ritzy. At the Ritzy cinema you can buy snacks like nachos, popcorn, drinks, chocolate and ice cream. There is also a cafe bar on the 1st and 2nd floors serving great food. If you like going to the cinema a lot you could buy a membership card. Membership costs £20 a year. 2 people living at the same address can get joint membership - for £35 a year. For more information follow this link or call 0870 7550 062. There is a payphone with an induction loop opposite the Box office. Hearing aid users should turn their aids to the T position. You will need to switch your hearing aid to the T setting. The cinema times may change depending on what's showing. If you want to book tickets phone 0870 7550 062. Its best to book if you are going as a group. People with disabilities, senior citizens, unemployed people, students and children can have a concession price. Supporters and carers go free! You may be asked to show some proof, like your Disability Living Allowance certificate or Lambeth Leisure Card. If you are going as a group ask about community rates. If you watch a movie before midday it will cost £3.50. If you watch a movie after midday it will cost £4.00. If you watch a movie after 5.00 pm it will cost you £5.50. On Thursday senior citizens pay £2.50 for any movie starting before midday. Coffees, teas and soft drinks about £1.00 - £1.50. A bottle of beer will cost about £2.80. 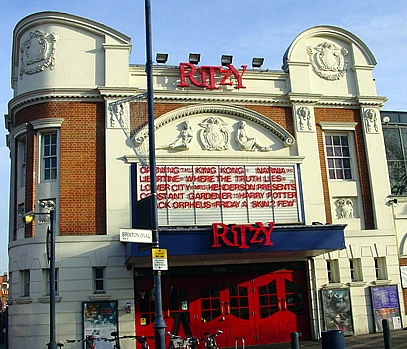 The Ritzy is near Brixton tube station. There are 3 disabled parking bays on Rushcroft road. There is a drop off point outside the cinema. 35, 45, 345 and N35 are the nearest fully accessible buses. (Victoria line) - Brixton underground station is about 80 metres from the cinema. Brixton underground station is not accessible for wheelchair users. Brixton mainline station is about 100 metres from the cinema. Brixton mainline station is not accessible for wheelchair users. The doors are very wide but can be heavy. The main doors are in view of the box office counter. The Ritzy cinema has 2 main floors and a mezzanine floor above the upstairs cafe. The mezzanine floor is not accessible for people using wheelchairs. Each screen has wheelchair spaces at the front of the screen. staff can remove seats If you need them to - you need to let them know in advance. Here you can find out what films are showing, meet friends, buy your tickets or relax in the downstairs cafe bar area. There is seating on the ground floor. There is a snack kiosk, accessible toilet (with baby change) and access to 4 screens. Screens 1-4 are on the ground floor. Has a bar cafe and comfortable places to sit. This is above the cafe area, you can see live music here. The lift does not go to the mezzanine floor. There is a lift to get to the first floor. The lift doorway is over 700 mm wide. There is a mirror in the lift for reversing. There is a baby change in the accessible toilet. All screens have hearing loops at the Ritzy cinema. Audio description is available for people with impaired site, this is a headset that picks up a recorded voice, you can pick up the headset from th ebox office, there is a £10.00 deposit for the headphones. Audio description is available on all films in screen one. Registered assistance dogs are welcome to go with you to watch a movie - let them know when booking so an aisle seat can be arranged. If you prefer your dog can be cared for by a member of staff while the movie plays. Find out what people said about the Ritzy's Autism friendly screenings.